This story is a bit out of order and actually occurred during the first few months of EQ. The Syndicate had started an event called Fight Night where we could gather in the Freeport Arena and spar and have fun. Back in those days it wasnt uncommon for a GM to interface with players and show up to events like this and fight. 25th level was considered "high" level then and few were past that yet. Fewer still were the number of actual guilds in game. Only 9 had been officially recognized/created on TM server by this point of which we were one. This fight night started like any other but after a time GM Hagarp showed up and began to fight with us. After we would wail on him and nearly kill him, he would sit, put on his ring of invulnerability and rest. 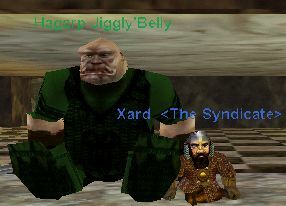 Here he is seen with SL Xard doing just that.